Monday, October 9, Warsaw hosted a meeting of Bucharest Nine which focused on "coordination among the Nine of activities in NATO, the EU, and the OSCE to address current security challenges and identify areas for further cooperation". In a joint statement on the results of the meeting, the Foreign Ministers of the Bucharest Nine countries declared their support for the territorial integrity of Ukraine and urged the Russian Federation to stop the aggression. 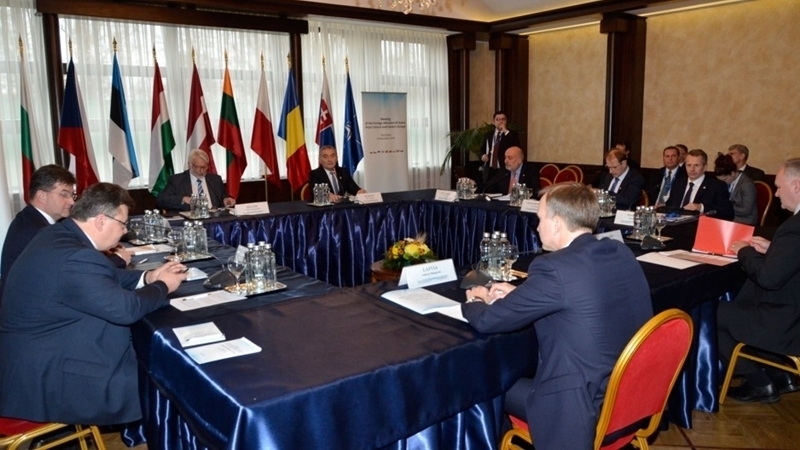 The Ministers of Foreign Affairs of the countries of the Bucharest Nine (including Poland, Bulgaria, Romania, Estonia, Latvia, Lithuania, Slovakia, Czech Republic, Hungary) made a joint statement in which they confirmed the support for the territorial integrity and sovereignty of Ukraine, called on Russia to stop the aggressive actions and withdraw troops from Ukraine, the Ukrainian embassy in Poland reports. "We reiterate our firm and principled position on Russia’s aggressive actions in Ukraine and that we will not recognize the illegal and illegitimate annexation of Crimea. We express our strong support to Ukraine’s sovereignty and territorial integrity within its internationally recognized borders. We express our concern with the security situation in eastern Ukraine and believe that tangible progress in the conflict settlement can be achieved only by full cease-fire, withdrawal of heavy equipment from the line of contact, and withdrawal of Russia’s weapons, equipment and personnel from Ukraine,” reads the text of the statement by the ministers. Furthermore, the Foreign Ministers of the countries of the Bucharest Nine strongly urge all parties that signed the Minsk agreements to fully fulfill their obligations. "We urge all signatories to the Minsk Agreements to fully comply with the commitments they signed up to. We continue to be concerned with the intimidation and attacks against OSCE Special Monitoring Mission’s monitors and recall that the SMM must have full, safe and unhindered access throughout Ukraine. We underline that the resolution of the conflict in and around Ukraine must be based on its territorial integrity and international law,” the statement says. Commenting on the latest statements of the President of the Czech Republic Miloš Zeman about compensation for Crimea, the Ministry of Foreign Affairs of Ukraine stated that the country will never trade its territory and freedom.